For the swing saxophonist and occasional singer, see Earle Warren. For the Wisconsin politician, see Earl W. Warren. "Justice Warren" redirects here. For other uses, see Justice Warren (disambiguation). 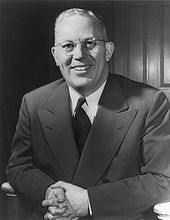 Earl Warren (March 19, 1891 – July 9, 1974) was an American jurist and politician who served as the 14th Chief Justice of the United States (1953–1969) and earlier as the 30th Governor of California (1943–1953). The Warren Court presided over a major shift in constitutional jurisprudence, with Warren writing the majority opinions in landmark cases such as Brown v. Board of Education, Reynolds v. Sims, and Miranda v. Arizona. Warren also led the Warren Commission, a presidential commission that investigated the 1963 assassination of President John F. Kennedy. He is as of 2019 the last Chief Justice to have served in an elected office. Warren was born in 1891 in Los Angeles and was raised in Bakersfield, California. After graduating from the law program at the University of California, Berkeley, he began a legal career in Oakland. He was hired as a deputy district attorney for Alameda County in 1920 and was appointed district attorney in 1925. He emerged as a leader of the state Republican Party and won election as the Attorney General of California in 1938. In that position, he played a role in the forced removal and internment of over 100,000 Japanese Americans during World War II. In the 1942 California gubernatorial election, Warren defeated incumbent Democratic governor Culbert Olson. He would serve as Governor of California until 1953, presiding over a period of major growth for the state. Warren served as Thomas E. Dewey's running mate in the 1948 presidential election, but Dewey lost the election to incumbent President Harry S. Truman. Warren sought the Republican nomination in the 1952 presidential election, but the party nominated General Dwight D. Eisenhower. After Eisenhower won election as president, he appointed Warren as Chief Justice. Warren helped arrange a unanimous decision in Brown v. Board of Education, which ruled that racial segregation in public schools was unconstitutional. After Brown, the Warren Court would continue to issue rulings that helped bring an end to the segregationist Jim Crow laws that were prevalent throughout the South. In Heart of Atlanta Motel, Inc. v. United States, the Court upheld the Civil Rights Act of 1964, a federal law that prohibits racial segregation in public institutions and public accommodations. In the 1960s, the Warren Court handed down several landmark rulings that transformed criminal procedure, redistricting, and other areas of the law. Many of the Court's decisions incorporated the Bill of Rights, making the protections of the Bill of Rights apply to state and local governments. Gideon v. Wainwright established a criminal defendant's right to an attorney in felony cases, while Miranda v. Arizona required police officers to give a warning to criminal suspects in police custody. Reynolds v. Sims established that all state legislative districts must be of roughly equal population, while the Court's holding in Wesberry v. Sanders required equal populations for congressional districts. Griswold v. Connecticut struck down a state law that restricted access to contraceptives and established a constitutional right to privacy. Warren announced his retirement in 1968, and was succeeded by conservative appellate judge Warren Burger. Though the Warren Court's rulings have received criticism from many conservatives, as well as from some other quarters, few of the Court's decisions have been overturned. Earl Warren was born in Los Angeles, California, on March 19, 1891, to Matt Warren and his wife, Crystal. Matt, whose original family name was Varren, was born in Stavanger, Norway in 1864, and he and his family migrated to the United States in 1866. Crystal, whose maiden name was Hernlund, was born in Hälsingland, Sweden; she and her family migrated to the United States when she was an infant. After marrying in Minneapolis, Minnesota, Mathias and Crystal settled in Southern California in 1889, where Matthias found work with the Southern Pacific Railroad. 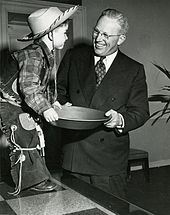 Earl Warren was the second of two children, after his older sister, Ethel. Earl did not receive a middle name; his father later commented that "when you were born I was too poor to give you a middle name." In 1896, the family resettled in Bakersfield, California, where Warren would grow up. Though not an exceptional student, Warren graduated from Kern County High School in 1908. Hoping to become a trial lawyer, Warren enrolled in the University of California, Berkeley after graduating from high school. He majored in political science and became a member of the La Junta Club, which became part of the national Sigma Phi fraternity while Warren was attending college. Like many other students at Berkeley, Warren was influenced by the Progressive movement, and he was especially affected by Governor Hiram Johnson of California and Senator Robert M. La Follette of Wisconsin. After his third year at Berkeley, Warren entered the school's Department of Jurisprudence, which was later renamed the UC Berkeley School of Law. Though the dean of the law school at one point urged Warren to drop out, Warren received a Juris Doctor degree in 1914. Like his classmates, upon graduation Warren was admitted to the California bar without examination. After graduation, he took a position with the Associated Oil Company in San Francisco. Warren disliked working at the Associated Oil Company and was disgusted by the corruption he saw in San Francisco, so he took a position with the Oakland law firm of Robinson and Robinson. After the United States entered World War I in April 1917, Warren volunteered for an officer training camp, but was rejected due to hemorrhoids. Still hoping to become an officer, Warren underwent a procedure to remove the hemorrhoids, but by the time he fully recovered from the operation the officer training camp had closed. Warren enlisted in the United States Army as a private in August 1917, and was assigned to Company I of the 91st Division's 363rd Infantry Regiment at Camp Lewis, Washington. He was made acting first sergeant of the company before being sent to a three-month officer training course. After he returned to the company in May 1918 as a second lieutenant, the regiment was sent to Camp Lee, Virginia, to train draftees. Warren spent the rest of the war there and was discharged less than a month after Armistice Day, following a promotion to first lieutenant. 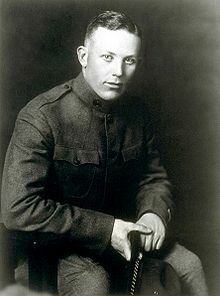 Warren would remain part of the United States Army Reserve until 1934, rising to the rank of captain. In late 1918, Warren returned to Oakland, where he accepted a position as the legislative assistant to Leon E. Gray, a newly-elected member of the California State Assembly. Shortly after arriving in the state capital of Sacramento, Warren was appointed as the clerk of the Assembly Judiciary Committee. After a brief stint as a deputy city attorney for Oakland, in 1920 Warren was hired as a deputy district attorney for Alameda County. By the end of 1924, Warren had become the most senior person in the department outside of the district attorney, Ezra Decoto. Though many of his professional colleagues supported Calvin Coolidge, Warren cast his vote for Progressive Party candidate Robert La Follette in the 1924 presidential election. That same year, Warren made his first foray into electoral politics, serving as the campaign manager for his friend, Republican Assemblyman Frank Anderson. With the support of Governor Friend Richardson and publisher Joseph R. Knowland, a leader of the conservative faction of San Francisco Bay Area Republicans, Warren was appointed as the Alameda County district attorney in 1925. Warren faced a tough re-election campaign in 1926, as local Republican boss Michael Joseph Kelly sought to unseat him. Warren rejected political contributions and largely self-funded his campaign, leaving him at a financial disadvantage to Kelly's preferred candidate, Preston Higgins. Nonetheless, Warren won a landslide victory over Higgins, taking over two-thirds of the vote. When he ran for re-election again in 1930, he faced only token opposition. Warren gained a statewide reputation as a tough, no-nonsense district attorney who fought corruption in government and ran his office in a nonpartisan manner. Warren strongly supported the autonomy of law enforcement agencies, but also believed that police and prosecutors had to act fairly. Unlike many other local law enforcement officials in the 1920s, Warren vigorously enforced Prohibition. In 1927, he launched a corruption investigation against Sheriff Burton Becker. After a trial that some in the press described as "the most sweeping exposé of graft in the history of the country," Warren won a conviction against Becker in 1930. When one of his own undercover agents admitted that he had perjured himself in order to win convictions in bootleg cases, Warren personally took charge of prosecuting the agent. Warren's efforts gained him national attention; a 1931 nationwide poll of law enforcement officials found that Warren was "the most intelligent and politically independent district attorney in the United States". The Great Depression hit the San Francisco Bay area hard in the 1930s, leading to high levels of unemployment and a destabilization of the political order. Warren took a hard stance against labor in the buildup to the San Francisco General Strike. In Whitney v. California (1927) Warren prosecuted a woman under the California Criminal Syndicalism Act for attending a communist meeting in Oakland. In 1936, Warren faced one of the most controversial cases of his career after George W. Alberts, the chief engineer of a freighter, was found dead. 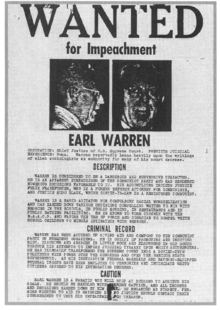 Warren believed that Alberts was murdered in a conspiracy orchestrated by radical left-wing union members, and he won the conviction of union officials George Wallace, Earl King, Ernest Ramsay, and Frank Conner. Many union members argued that the defendants had been framed by Warren's office, and they organized protests of the trial. While continuing to serve as the district attorney of Alameda County, Warren emerged as leader of the state Republican Party. He served as the county chairman for Herbert Hoover's 1932 campaign and, after Franklin D. Roosevelt won that election, he attacked Roosevelt's New Deal policies. In 1934, Warren became chairman of the state Republican Party and he took a leading public role in opposing the gubernatorial candidacy of Democrat Upton Sinclair. Warren earned national notoriety in 1936 for leading a successful campaign to elect a slate of unpledged delegates to the 1936 Republican National Convention; he was motivated largely by his opposition to the influence of Governor Frank Merriam and publisher William Randolph Hearst. In the 1936 presidential election, Warren campaigned on behalf of the unsuccessful Republican nominee, Alf Landon. After World War I, Warren lived with his sister and her husband in Oakland. In 1921, he met Nina Elisabeth Meyers (née Palmquist), a widowed, 28-year-old store manager with a three-year-old son. Nina had been born in Sweden to a Baptist minister and his wife, and her family had migrated to the United States when she was an infant. On October 4, 1925, shortly after Warren was appointed district attorney, Warren and Nina married. Their first child, Virginia, was born in 1928, and they had four more children: Earl Jr. (born 1930), Dorothy (born 1931), Nina Elisabeth (born 1933), and Robert (born 1935). Warren also adopted Nina's son, James. Warren enjoyed a close relationship with his wife; one of their daughters later described it as "the most ideal relationship I could dream of." In 1935, the family moved to a seven-bedroom home just outside of downtown Oakland. Though the Warrens sent their children to Sunday school at a local Baptist church, Warren was not a regular churchgoer. In 1938, Warren's father, Matt, was murdered; investigators never discovered the identity of the murderer. Warren and his family moved to the state capital of Sacramento in 1943, and to Wardman-Park, a residential hotel in Washington, D.C., in 1953. Warren was very active after 1919 in such groups as the Freemasonry, the Independent Order of Odd Fellows, the Benevolent and Protective Order of Elks, the Loyal Order of Moose (obtained the Pilgrim Degree of Merit, the highest award given in the fraternity) and the American Legion. Each one introduced Warren to new friends and political connections. He rose through the ranks in the Masons, culminating in his election in 1935 as the Grand Master of the Freemasons for the state of California from 1935 to 1936. Biographer Jim Newton says that Warren, "thrived in the Masons because he shared their ideals, but those ideals also helped shape him, nurturing his commitment to service, deepening his conviction that society's problems were best addressed by small groups of enlightened, well-meaning citizens. Those ideals knitted together Warren's Progressivism, his Republicanism, and his Masonry." In 1934, Warren and his allies won passage of a state ballot measure that transformed the position of Attorney General of California into a full-time office; previous officeholders had worked part-time while maintaining their own private practice. After incumbent Ulysses S. Webb announced his retirement, Warren jumped into the 1938 state attorney general election. Earlier in the 20th century, progressives had passed a state constitutional amendment allowing for "cross-filing," whereby a candidate could file to run in multiple party primaries for the same office. Warren took advantage of that amendment and ran in multiple primaries. Even though he continued to serve as chairman of the state Republican Party until April 1938, Warren won the Republican, Progressive, and, crucially, Democratic primaries for attorney general. He faced no serious opposition in the 1938 elections, even while incumbent Republican Governor Frank Merriam was defeated by Democratic nominee Culbert Olson. Once elected, he organized state law enforcement officials into regions and led a statewide anti-crime effort. One of his major initiatives was to crack down on gambling ships operating off the coast of Southern California. Warren continued many of the policies from his predecessor Ulysses S. Webb's four decades in office. These included eugenic forced sterilizations and the confiscation of land from Japanese owners. Warren, who was a member of the outspoken anti-Asian society Native Sons of the Golden West, successfully sought legislation expanding the land confiscations. After World War II broke out in Europe in 1939, foreign policy became an increasingly important issue in the United States; Warren rejected the isolationist tendencies of many Republicans and supported Roosevelt's rearmament campaign. The United States entered World War II after the Japanese Attack on Pearl Harbor in December 1941. Following the attack, Warren organized the state's civilian defense program, warning in January 1942 that, "the Japanese situation as it exists in this state today may well be the Achilles' heel of the entire civilian defense effort." He became a driving force behind the internment of over one hundred thousand Japanese Americans without any charges or due process. Though the decision to intern Japanese Americans was made by General John L. DeWitt, and the internment was carried out by federal officials, Warren's advocacy played a major role in providing public justification for the internment. By early 1944, Warren had come to regret his role in the internment of Japanese Americans, and he approved of the federal government's decision to allow Japanese Americans to begin returning to California in December 1944. Warren frequently clashed with Governor Culbert Olson over various issues, partly because they belonged to different parties. As early as 1939, supporters of Warren began making plans for his candidacy in California's 1942 gubernatorial election. Though initially reluctant to run, Warren announced his gubernatorial candidacy in April 1942. He cross-filed in the Democratic and Republican primaries, ran without a party label, and refused to endorse candidates running for other offices. He sought to voters regardless of party, and stated "I can and will support President Roosevelt better than Olson ever has or ever will." Many Democrats, including Olson, criticized Warren for "put[ting] on a cloak of nonpartisanship," but Warren's attempts to appear above parties resonated with many voters. In August, Warren easily won the Republican primary, and surprised many observers by nearly defeating Olson in the Democratic primary. In November, he decisively defeated Olson in the general election, taking just under 57 percent of the vote. Warren's victory immediately made him a figure with national stature, and he enjoyed good relations with both the conservative wing of the Republican Party, led by Robert A. Taft, and the moderate wing of the Republican Party, led by Thomas E. Dewey. Warren modernized the office of governor, and state government generally. Like most progressives, Warren believed in efficiency and planning. During World War II, he aggressively pursued postwar economic planning. Fearing another postwar decline that would rival the depression years, Governor Earl Warren initiated public works projects similar to those of the New Deal to capitalize on wartime tax surpluses and provide jobs for returning veterans. For example, his support of the Collier-Burns Act in 1947 raised gasoline taxes that funded a massive program of freeway construction. Unlike states where tolls or bonds funded highway construction, California's gasoline taxes were earmarked for building the system. Warren's support for the bill was crucial because his status as a popular governor strengthened his views, in contrast with opposition from trucking, oil, and gas lobbyists. The Collier-Burns Act helped influence passage of the Federal Aid Highway Act of 1956, setting a pattern for national highway construction. In the mid-1940s, Warren sought to implement a state universal health care, but he was unable to pass his plan due to opposition from the medical and business communities. Warren also pursued social legislation. He built up the state's higher education system based on the University of California and its vast network of small universities and community colleges. After federal courts declared the segregation of Mexican schoolchildren illegal in Mendez v. Westminster (1947) Governor Warren signed legislation ending the segregation of American Indians and Asians. He sought the creation of a commission to study employment discrimination, but his plan was blocked by Republicans in the state legislature. Governor Warren stopped enforcing California's anti-miscegenation law after it was declared unconstitutional in Perez v. Sharp (1948). He also improved the hospital and prison systems. These reforms provided new services to a fast-growing population; the 1950 Census showed that California's population had grown by over 50% over the previous ten years. By 1946, California's economy was booming, Warren was widely popular, and he enjoyed excellent relations with the state's top Democratic officeholder, Attorney General Robert W. Kenny. At the urging of state party leaders, Kenny agreed to run against Warren in the 1946 gubernatorial election, but Kenny was reluctant to criticize his opponent and was distracted by his role in the Nuremberg trials. As in 1942, Warren refused to endorse candidates for other offices, and he sought to portray himself as an effective, nonpartisan governor. Warren easily won the Republican primary for governor and, in a much closer vote, defeated Kenny in the Democratic primary. After winning both primaries, Warren endorsed Republican William Knowland's U.S. Senate candidacy and Goodwin Knight's candidacy for lieutenant governor. Warren won the general election by an overwhelming margin, becoming the first Governor of California since Hiram Johnson in 1914 to win a second term. Though he considered retiring after two terms, Warren ultimately chose to seek re-election in 1950, partly to prevent Knight from succeeding him. He easily won the Republican primary, but was defeated in the Democratic primary by James Roosevelt. Warren consistently led Roosevelt in general election polls and won re-election in a landslide, taking 64 percent of the vote. Warren was the first individual to serve as Governor of California for three terms. During the 1950 campaign, Warren refused to formally endorse Richard Nixon, the Republican candidate for Senate. Warren disliked what he saw as Nixon's ruthless approach to politics and was wary of having a conservative rival for leadership of the state party. Despite Warren's refusal to campaign for him, Nixon defeated Democratic nominee Helen Gahagan Douglas by a decisive margin. After his election as governor, Warren emerged as a potential candidate for president or vice president in the 1944 election. Seeking primarily to ensure his status as the most prominent Republican in California, he ran as a favorite son candidate in the 1944 Republican primaries. Warren won the California primary with no opposition, but Thomas Dewey clinched the party's presidential nomination by the time of the 1944 Republican National Convention. Warren delivered the keynote address of the convention, in which he called for a more liberal Republican Party. Dewey asked Warren to serve as his running mate, but Warren was uninterested in the vice presidency and correctly believed that Dewey would be defeated by President Roosevelt in the 1944 election. After his 1946 re-election victory, Warren began planning a run for president in the 1948 election. The two front-runners for the nomination were Dewey and Robert Taft, but Warren, Harold Stassen, Arthur Vandenberg, and General Douglas MacArthur each had significant support. Prior to the 1948 Republican National Convention, Warren attempted to position himself as a dark horse candidate who might emerge as a compromise nominee. However, Dewey won the nomination on the third ballot of the convention. Dewey once again asked Warren to serve as his running mate, and this time Warren agreed. Far ahead in the polls against President Harry S. Truman, the Democratic nominee, Dewey ran a cautious campaign that largely focused on platitudes rather than issues. Warren campaigned across the country on behalf of the ticket, but was frustrated by his inability to support specific policies. To the surprise of many observers, Truman won the election. After his 1950 re-election, Warren decided that he would seek the Republican nomination in the 1952 presidential election, and he announced his candidacy in November 1951. Taft also sought the nomination, but Dewey declined to make a third run for president. Dewey and his supporters instead conducted a long campaign to draft General Dwight D. Eisenhower as the Republican presidential nominee. Warren ran in three Republican presidential primaries, but won just a handful of delegates outside of his home state. In the California primary, he defeated a challenge from Thomas H. Werdel, whose conservatives backers alleged that Warren had "abandoned Republicanism and embraced the objectives of the New Deal." After Eisenhower entered the race, Warren realized that his only hope of nomination was to emerge as a compromise nominee at the 1952 Republican National Convention after a deadlock between supporters of Eisenhower and Taft. After the primaries, Warren had the support of 80 delegates, while Eisenhower and Taft each had about 450 delegates. Though the California delegation was pledged to support Warren, many of the delegates personally favored Eisenhower or Taft. Unknown to Warren, Eisenhower supporters had promised Richard Nixon the vice presidency if he could swing the California delegation to Eisenhower. By the time of the convention, Nixon and his supporters had convinced most California delegates to switch their votes to Eisenhower after the first presidential ballot. Eisenhower won 595 votes on the first presidential ballot of the convention, just 9 short of the majority. Before the official end of the first ballot, several states shifted their votes to Eisenhower, giving him the nomination. Warren's decision to support a convention rule that unseated several contested delegations was critical to Eisenhower's victory; Eisenhower himself said that "if anyone ever clinched the nomination for me, it was Earl Warren." Nixon was named as Eisenhower's running mate, and Warren campaigned on behalf of the Republican ticket in fourteen different states. Ultimately, Eisenhower defeated Democratic nominee Adlai Stevenson II, taking 55 percent of the national popular vote. Nixon resigned from the Senate to become vice president, and Warren appointed Thomas Kuchel to the Senate seat vacated by Nixon. After the 1952 election, President-elect Eisenhower promised that he would appoint Warren to the next vacancy on the Supreme Court of the United States. Warren turned down the position of Secretary of Interior in the new administration, but in August 1953 he agreed to serve as the Solicitor General of the United States. In September 1953, before Warren's nomination as solicitor general was announced, Chief Justice Fred M. Vinson died. To fill the critical position of chief justice, Eisenhower considered either elevating a sitting Supreme Court justice or appointing another individual with judicial experience, but he ultimately chose to honor his promise to appoint Warren to the first Supreme Court vacancy. Explaining Warren's qualifications for the Court, Eisenhower wrote to his brother that "Warren has had seventeen years of practice in public law, during which his record was one of remarkable accomplishment and success ... He has been very definitely a liberal-conservative; he represents the kind of political, economic, and social thinking that I believe we need on the Supreme Court." Warren received a recess appointment in October 1953, and the Senate confirmed Warren's appointment by acclamation in March 1954. Warren is the most recent Supreme Court justice to have held statewide elected office at any point in their career, as well as the most recent serving politician to be appointed to the Supreme Court. As chief justice, Warren's most important prerogative was the power to assign opinions so long as he was in the majority; that power had a subtle but important role in shaping the Court's majority opinions, since different individuals would write different opinions. Warren initially asked the senior associate justice, Hugo Black, to preside over conferences until he became accustomed to the processes of the Court. However, Warren learned quickly and soon was in fact, as well as in name, the Court's chief justice. Warren's strength lay in his public gravitas, his leadership skills, and in his firm belief that the Constitution guaranteed natural rights and that the Court had a unique role in protecting those rights. His arguments did not dominate judicial conferences, but Warren excelled at putting together coalitions and cajoling his colleagues in informal meetings. Warren saw the Constitution as the embodiment of American values, and he cared deeply about the ethical implications of the Court's rulings. According to Justice Potter Stewart, Warren's philosophical foundation were the "eternal, rather bromidic, platitudes in which he sincerely believed" and "Warren's great strength was his simple belief in the things we now laugh at: motherhood, marriage, family, flag, and the like." Constitutional historian Melvin I. Urofsky concludes that "scholars agree that as a judge, Warren does not rank with Louis Brandeis, Black, or Brennan in terms of jurisprudence. His opinions were not always clearly written, and his legal logic was often muddled." Other scholars have also reached this conclusion. Soon after joining the Court, Warren presided over the case of Brown v. Board of Education, which arose from the NAACP's legal challenge against Jim Crow laws in the Southern United States. Southern states had implemented Jim Crow laws in aftermath of the Reconstruction Era to disenfranchise African Americans and segregate public schools and other institutions. In the 1896 case of Plessy v. Ferguson, the Court had held that the Fourteenth Amendment did not prohibit segregation in public institutions so long as the institutions were "separate but equal." In the decades after Plessy, the NAACP had won several incremental victories, but 17 states required the segregation of public schools by 1954. In 1951, the Vinson Court had begun hearing the NAACP's legal challenge to segregated school systems, but it had not rendered a decision by the time Warren took office. By the early 1950s, Warren had become personally convinced that segregation was morally wrong and legally indefensible. Warren sought not only to overturn Plessy, but to do so with a unanimous verdict. Warren, Black, Douglas, and two other justices supported overturning the precedent, but, for different reasons, Jackson, Frankfurter, Tom C. Clark and Stanley Forman Reed were reluctant to overturn Plessy. Nonetheless, Warren won over Jackson, Frankfurter, and Clark, in part by allowing states and federal courts the flexibility to pursue desegregation of schools at different speeds. Warren extensively courted the last holdout, Reed, who finally agreed to join a unanimous verdict because he feared a dissent would encourage resistance to the Court's holding. After the Supreme Court formally voted to hold that the segregation of public schools was unconstitutional, Warren drafted an eight page outline from which his law clerks drafted an opinion, and the Court handed down its decision in May 1954. Meanwhile, many Southern politicians expressed outrage at the Court's decisions and promised to resist any federal attempt to force desegregation, a strategy known as massive resistance. Although Brown did not mandate immediate school desegregation or bar other "separate but equal" institutions, most observers recognized that the decision marked the beginning of the end for the Jim Crow system. Throughout his years as Chief, Warren succeeded in keeping decisions concerning segregation unanimous. Brown applied to schools, but soon the Court enlarged the concept to other state actions, striking down racial classification in many areas. Warren did compromise by agreeing to Frankfurter's demand that the Court go slowly in implementing desegregation; Warren used Frankfurter's suggestion that a 1955 decision (Brown II) include the phrase "all deliberate speed". In 1956, after the Montgomery bus boycott, the Supreme Court affirmed a lower court's decision that had held that segregated buses were unconstitutional. Two years later, he assigned Brennan to write the Court's opinion Cooper v. Aaron; Brennan held that state officials were legally bound to enforce the Court's desegregation ruling in Brown. In the 1956 term, the Warren Court earned the condemnation of anti-Communists like Senator Joseph McCarthy by handing down a series of decisions, including Yates v. United States, that struck down laws designed to suppress Communists. The Warren Court's holdings in these cases represented a major shift from the Vinson Court, which had generally upheld such laws during the Second Red Scare. 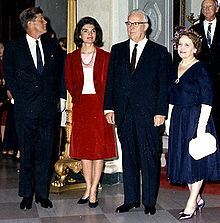 After the Republican Party nominated Nixon in the 1960 presidential election, Warren privately supported Democratic nominee John F. Kennedy. The two became personally close after Kennedy was inaugurated; Warren later wrote that "no American during my long life ever set his sights higher for a better America or centered his attacks more accurately on the evils and shortcomings of our society than did [Kennedy]." In 1962, Warren switched his party registration to the Democratic Party and endorsed Democratic Governor Pat Brown's ultimately successful re-election campaign against Richard Nixon. That same year, Frankfurter retired and was replaced by Kennedy appointee Arthur Goldberg, giving the liberal bloc a majority on the Court. Goldberg left the Court in 1965, but was replaced by Abe Fortas, who largely shared Goldberg's judicial philosophy. With the liberal bloc firmly in control, the Warren Court handed down a series of momentous rulings in the 1960s. The 1960s marked a major shift in constitutional interpretation as the Warren Court continued the process of the Incorporation of the Bill of Rights, whereby the provisions of the first ten amendments to the constitution were applied to the states. [b] Warren saw the Bill of Rights as a codification of "the natural rights of man" against the government, and he believed that incorporation would bring the law "into harmony with moral principles." By the time Warren took office, most of the provisions of the First Amendment already applied to the states, but the vast majority of the Bill of Rights applied only to the federal government. The Warren Court saw the incorporation of the remaining provisions of the First Amendment, as well as all or part of the Fourth, Fifth, Sixth, and Eighth amendments. The Warren Court also handed down numerous other important decisions regarding the Bill of Rights, especially in the field of criminal procedure. In New York Times Co. v. Sullivan, the Court reversed a libel conviction of the publisher of The New York Times. In the majority opinion, Justice Brennan articulated the actual malice standard for libel against public officials, and that standard became an enduring part of constitutional law. In Tinker v. Des Moines Independent Community School District, the Court reversed the suspension of an eighth grade student who wore a black armband in protest of the Vietnam War. Fortas's majority opinion in that case noted that students did not "shed their constitutional rights to freedom of speech or expression at the schoolhouse gate." The Court's holding in United States v. Seeger expanded those who could be classified as conscientious objectors under the Selective Service System; Seeger allowed nonreligious individuals with ethical objections to claim conscientious objector status. Another case, United States v. O'Brien, saw the Court uphold a prohibition against burning draft-cards. Warren dissented in the case of Street v. New York, in which the Court struck down a state law that prohibited the desecration of the American flag. When his law clerks asked why he dissented in the case, Warren stated, "Boys, it's the American flag. I'm just not going to vote in favor of burning the American flag." In the 1969 case of Brandenburg v. Ohio, the Warren Court held that government cannot punish speech unless that speech is "directed to inciting or producing imminent lawless action and is likely to incite or produce such action." In the 1962 case of Engel v. Vitale, the Court held that the Establishment Clause prohibits mandatory prayer in public school. The ruling sparked a strong backlash from many political and religious leaders, some of whom called for the impeachment of Warren. Warren became a favored target of right-wing groups like the John Birch Society, as well as 1964 Republican presidential nominee Barry Goldwater. Engel, the criminal procedure cases, and the persistent criticism of conservative politicians like Goldwater and Richard Nixon contributed to a decline in the Court's popularity in the mid- and late 1960s. The Court's holding in Griswold v. Connecticut struck down a state law designed to restrict access to contraception and established a constitutional right to privacy. Griswold would provide an important precedent for the later case of Roe v. Wade, which disallowed many laws designed to restrict access to abortion. In the early 1960s, the Court increasingly turned its attention to criminal procedure, which had traditionally been primarily a domain of the states. In the 1960 case of Elkins v. United States, Warren joined with the majority in striking down the "Silver Platter Doctrine," a loophole to the exclusionary rule that had allowed federal officials to use evidence that had been illegally gathered by state officials. The following year, in Mapp v. Ohio, the Court held that the Fourth Amendment's prohibition on "unreasonable searches and seizures" applied to state officials. Warren wrote the majority opinion in Terry v. Ohio, a 1968 case in which the Court established that a police officer can frisk a criminal suspect if they have a reasonable suspicion that the suspect is committing or is about to commit a crime. In the 1962 case of Gideon v. Wainwright, the Court held that the Sixth Amendment required states to furnish publicly funded attorneys to all criminal defendants accused of a felony and unable to afford counsel. Prior to Gideon, criminal defendants had only been guaranteed the right to counsel in federal trials and capital cases. In the 1964 case of Escobedo v. Illinois, the Court held that the Sixth Amendment guarantees criminal suspects the right to speak to their counsel during police interrogations. Escobedo was limited only to those criminal suspects who had an attorney at the time of their arrest and who requested to speak with that counsel. In the landmark case of Miranda v. Arizona, Warren wrote a majority opinion that established a right to counsel for every criminal suspect. His holding required police to give criminal suspects what became known as a "Miranda warning," in which the suspect is notified of their right to an attorney and their right to silence. Though he incorporated some suggestions from Justice Brennan, Warren's holding in Miranda was most influenced by his past experiences as a district attorney. Unlike many of the other Warren Court decisions, including Mapp and Gideon, the holding in Miranda created standards that went far beyond anything that had been established by any of the states. Miranda received a strong backlash from law enforcement officials and political leaders. Conservatives angrily denounced what they called the "handcuffing of the police." In 1959, several residents dissatisfied with Tennessee's legislative districts brought suit against the state of Tennessee in the case of Baker v. Carr. Like many other states, Tennessee had state legislative districts of unequal populations,[c] and the plaintiffs sought more equitable legislative districts. In the 1946 case of Colegrove v. Green, the Supreme Court had declined to become involved in legislative apportionment, instead leaving the issue as a matter for Congress and the states. In the 1960 case of Gomillion v. Lightfoot, the Court struck down a redistricting plan designed to disenfranchise African-American voters, but many of the justices were reluctant to become further involved in redistricting. Associate Justice Frankfurter insisted that the Court should avoid the "political thicket" of apportionment, and warned that the Court would never be able to find a clear formula to guide lower courts. Warren helped convince Associate Justice Potter Stewart to join Brennan's majority decision in Baker v. Carr, which held that redistricting was not a political question and thus the federal courts had jurisdiction over the issue. The opinion did not directly require Tennessee to implement redistricting, instead leaving it to a federal district court to determine whether Tennessee's districts violated the Constitution. In another case, Gray v. Sanders, the Court struck down Georgia's County Unit System, which granted disproportional power to rural counties in party primaries. The Court's holding in a third case, Wesberry v. Sanders, required states to draw congressional districts of equal population. In the 1964 case of Reynolds v. Sims, the chief justice wrote what biographer Ed Cray terms "the most influential of the 170 majority opinions [Warren] would write." While eight of the nine justices had voted to require congressional districts of equal population in Wesberry, some of the justices were reluctant to require that state legislative districts be of equal population. Warren indicated that the Equal Protection Clause required that state legislative districts be apportioned on an equal basis, writing that "legislators represent people, not trees or acres. Legislators are elected by voters, not farms or cities or economic interests." His holding upheld the principle of "one man, one vote," which had previously been articulated by Associate Justice Douglas. After the decision, the states reapportioned their legislatures quickly and with minimal troubles. Numerous commentators have concluded reapportionment was the Warren Court's great "success story." Civil rights continued to be a major issue facing the Warren Court in the 1960s. In the 1963 case of Petersen v. Greenville, Warren wrote the Court's majority opinion, which struck down local ordinances that prohibited restaurants from serving black and white individuals in the same room. Later in the decade, the Court upheld the constitutionality of the Civil Rights Act of 1964 in Heart of Atlanta Motel, Inc. v. United States. The Court held that the Commerce Clause empowered the federal government to prohibit racial segregation in public accommodations like hotels. The ruling effectively overturned the 1883 Civil Rights Cases, in which the Supreme Court had held that Congress could not regulate racial discrimination by private businesses. The Court upheld another landmark civil rights act, the Voting Rights Act of 1965, holding that it was valid under the authority provided to Congress by the Fifteenth Amendment. Warren wrote the majority opinion in the case of Loving v. Virginia, in which the Court struck down state laws banning interracial marriage. Warren was particularly pleased by the ruling in Loving, since he had long regretted that the Court had not taken up the similar case of Naim v. Naim in 1955. In the 1966 case of Harper v. Virginia State Board of Elections, the Court struck down poll taxes in state elections. In another case, Bond v. Floyd, the Court required the Georgia legislature to seat newly-elected legislator Julian Bond; members of the legislature had refused to seat Bond because he opposed the Vietnam War. 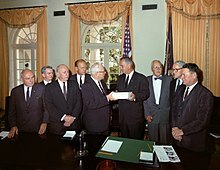 Commissioner Warren presents his report to President Johnson on September 24, 1964. Shortly after the Assassination of John F. Kennedy, newly-inaugurated President Lyndon B. Johnson convinced Warren to serve as the head of a bipartisan commission tasked with investigating the assassination. Many individuals, both inside and outside the United States, suspected that Kennedy had been assassinated as part of a conspiracy by Cuba, right-wing groups, or various other organizations. From December 1963 to October 1964, Warren simultaneously served chief justice of the Supreme Court and chairman of the Warren Commission. It was an unhappy experience for the chief justice. As a judge, he valued candor and justice, but as a politician he recognized the need for secrecy in some matters. He insisted that the commission report should be unanimous, and so he compromised on a number of issues in order to get all the members to sign the final version. The commission concluded that the assassination was the result of a single individual, Lee Harvey Oswald, acting alone. Though it initially received a favorable reception, the Warren Report became a controversial document, and a 1967 Gallup poll showed that a majority of Americans believed that Oswald was not the lone assassin. The Warren Commission weakened its findings by not sharing the government's deepest secrets. The report's lack of candor furthered antigovernment cynicism, which in turn stimulated conspiracy theorists who propounded any number of alternative scenarios, many of which appear mutually contradictory. Many conspiracy theorists have attacked the commission's findings ever since, claiming that key evidence is missing or distorted and that there are many inconsistencies in the report. Warren personally believed that Oswald had acted alone, writing "the facts of the assassination itself are simple, so simple that many people believe it must be more complicated and conspiratorial to be true." 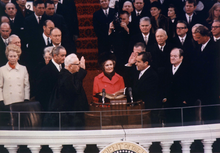 Chief Justice Warren swears in President Nixon on January 20, 1969. By 1968, Warren was ready to retire from the Court; he hoped to travel the world with his wife, and he wanted to leave the bench before he suffered a mental decline, something he perceived in both Hugo Black and William Douglas. He also feared that Richard Nixon would win the 1968 presidential election and appoint a conservative successor should Warren leave the Court at a future date. In June 1968, Warren submitted his letter of resignation to President Johnson, with the resignation effective upon the confirmation of a successor. In an election year, confirmation of a successor was not assured; after Warren announced his retirement, about half of the Senate Republican caucus pledged to oppose any Supreme Court appointment prior to the election. Johnson nominated Associate Justice Abe Fortas, a personal friend and adviser to the president, as Warren's successor, and nominated federal appellate judge Homer Thornberry to succeed Fortas. Republicans and Southern Democrats joined together to scuttle Fortas's nomination. Their opposition centered on criticism of the Warren Court (including many decisions that had been handed down before Fortas joined the Court), as well as ethical concerns related to Fortas's paid speeches and closeness with President Johnson. Though a majority of the Senate may have favored the confirmation of Fortas, opponents conducted a filibuster that blocked the Senate from voting on the nomination, and Johnson withdrew the nomination. In early 1969, Warren learned that Fortas had made a secret lifetime contract for $20,000 a year to provide private legal advice to Louis Wolfson, a friend and financier in deep legal trouble. Warren immediately asked Fortas to resign, which he did after some consideration. Nixon defeated Hubert Humphrey in the 1968 presidential election, and took office in January 1969. Though reluctant to be succeeded by a Nixon appointee, Warren declined to withdraw his letter of resignation; he believed that withdrawing the letter would be "a crass admission that he was resigning for political reasons." Nixon and Warren jointly agreed that Warren would retire in June 1969, ensuring that the Court would have a chief justice throughout the 1968 term and allowing Nixon to focus on other matters in the first months of his presidency. Nixon did not solicit Warren's opinion regarding the next chief justice, and he ultimately appointed conservative federal appellate judge Warren E. Burger. Warren later regretted his decision to retire, reflecting "If I had ever known what was going to happen to this country and this Court, I never would have resigned. They would have had to carry me out of there on a plank". After stepping down from the Court, Warren began working on his memoirs and took numerous speaking engagements. He also advocated for an end to the Vietnam War and the elimination of poverty. He avoided publicly criticizing the Burger Court, but was privately distressed by the Court's more conservative holdings. He closely followed investigations into the Watergate scandal, a major political scandal that stemmed from a break-in of the Democratic National Committee's headquarters and the Nixon administration's subsequent attempts to cover up that break-in. Warren continued to hold Nixon in low regard, privately stating that Nixon was "perhaps the most despicable president that this country has ever had." Five years into retirement, Warren died at Georgetown University Hospital in Washington, D.C., at 8:10 PM on July 9, 1974. On that same day, he was visited by Justices Brennan and Douglas. Warren could not resist asking his friends whether the Court would order President Nixon to release the sixty-four tapes demanded by the Watergate investigation. Both justices assured him that the court had voted unanimously in United States v. Nixon for the release of the tapes. Relieved, Warren died just a few hours later, safe in the knowledge that the Court he had so loved would force justice on the man who had been his most bitter foe and about a month before his own resignation. [d] After he lay in repose in the Great Hall of the United States Supreme Court Building, his funeral was held at Washington National Cathedral, and he was interred at Arlington National Cemetery. According to biographer Ed Cray, Warren was "second in greatness only to John Marshall himself in the eyes of most impartial students of the Court as well as the Court's critics." Anthony Lewis described Warren as "the closest thing the United States has had to a Platonic Guardian". The Warren Court was also a huge target of criticism in originalist Raoul Berger's 1977 book Government by Judiciary, where he accused the Warren Court of overstepping its authority by interpreting the 14th Amendment in a way contrary to the original intent of its draftsmen and framers in order to achieve results that it found desirable as a matter of public policy. Chief Justice Burger proved to be quite ineffective at consolidating conservative control over the Court, so the Warren Court legacy continued in many respects until about 1986, when William Rehnquist became chief justice and took firmer control of the agenda. Even the more conservative Rehnquist Court refrained from expressly overturning major Warren Court cases like Miranda, Gideon, Brown v. Board of Education, and Reynolds v. Sims. On occasion, the Rehnquist Court even expanded Warren Court precedents--such as in Bush v. Gore, where the Rehnquist Court applied the principles of 1960s voting rights cases to invalidate Florida's recount in the 2000 United States presidential election. Warren's critics found him a boring person. "Although Warren was an important and courageous figure and although he inspired passionate devotion among his followers...he was a dull man and a dull judge," observed Dennis J. Hutchinson. Political conservatives attacked the Warren Court's rulings as inappropriate and have called for courts to be deferential to the elected political branches. Law professor Justin Driver divides interpretations of the Warren Court into three main groups: conservatives like Robert Bork who attack the Court as "a legislator of policy...that was not theirs to make," liberals like Morton Horwitz who strongly approve of the Court, and liberals like Cass Sunstein who largely approve of the Court's overall legacy but believe that it went too far in making policy in some cases. Driver offers a fourth view, arguing that the Warren Court took overly conservative stances in cases like Powell v. Texas and Hoyt v. Florida. A number of educational and governmental institutions have been named for Warren. In 1977, Fourth College, one of the six undergraduate colleges at the University of California, San Diego, was renamed Earl Warren College in his honor. The California State Building in San Francisco; Earl Warren Middle School in Solana Beach, California; elementary schools in Garden Grove, and Lake Elsinore, California; a junior high school in his home town of Bakersfield, California; high schools in San Antonio, Texas (Earl Warren High School), and Downey, California (Warren High School); and a building at the high school he attended (Bakersfield High School) are named for him, as are the showgrounds in Santa Barbara, California. The freeway portion of State Route 13 in Alameda County is the Warren Freeway. The Warren Reading Room at Boalt Hall was also named in his honor. The Earl Warren Bill of Rights Project is also named in his honor. He was awarded the Presidential Medal of Freedom posthumously in 1981. He was also honored by the United States Postal Service with a 29¢ Great Americans series postage stamp. In December 2007, Warren was inducted into the California Hall of Fame. An extensive collection of Warren's papers, including case files from his Supreme Court service, is located at the Manuscript Division of the Library of Congress in Washington, D.C. Most of the collection is open for research. Super Chief: The Life and Legacy of Earl Warren, a documentary about Warren, was produced in 1989. Warren is portrayed in JFK, Gideon's Trumpet, and Separate but Equal. In the alternate history Worldwar: Colonization trilogy by Harry Turtledove, Warren is depicted as being the President of the United States in the early 1960s. ^ Eisenhower biographer Jean Edward Smith concluded in 2012 that "Eisenhower never said that. I have no evidence that he ever made such a statement." Nonetheless, Eisenhower privately expressed his displeasure regarding some of Warren's decisions, while Warren grew frustrated at Eisenhower's unwillingness to publicly support the Court's holding in Brown v. Board of Education. In 1961, when Eisenhower was asked whether he had made any major mistakes as president, the former president responded "yes, two, and they are both sitting on the Supreme Court." ^ The original Bill of Rights did not apply to the states, but the Fourteenth Amendment (ratified in 1868) contains a Due Process Clause that applies to state governments, and the Court has used that clause to incorporate the Bill of Rights. Though some, including William Douglas, favored the total incorporation of the Bill of Rights, the Court has selectively incorporated various provisions of the Bill of Rights across numerous cases. The first major incorporation case was Gitlow v. New York (1925). ^ The Vermont General Assembly provides one example of the disparity in populations. In 1961, one member of the Vermont General Assembly represented 33,000 people, while another member represented 49 people. ^ Facing impeachment, Nixon resigned from office on August 9, 1974. He was succeeded by Gerald Ford. ^ Cray 1997, pp. 16–18. ^ Cray 1997, pp. 19–21. ^ Cray 1997, pp. 23–26. ^ Cray 1997, pp. 27–28, 31. ^ Cray 1997, pp. 28–30. ^ Cray 1997, pp. 30–32. ^ Cray 1997, pp. 32–33. ^ Cray 1997, pp. 35–36. ^ Cray 1997, pp. 37–38. ^ Cray 1997, pp. 41–42. ^ Cray 1997, pp. 45–47. ^ Cray 1997, pp. 44, 50–53. ^ Cray 1997, p. 57. ^ White 1982, Ch. 2. ^ Cray 1997, p. 55. ^ Cray 1997, pp. 54–57. ^ Cray 1997, p. 58. ^ Cray 1997, pp. 60–61. ^ Cray 1997, pp. 65–66. ^ David Skover and Ronald Collins, A Curious Concurrence: Justice Brandeis' Vote in Whitney v. California, 2005 Supreme Court Review 333 (2005). ^ Cray 1997, pp. 82–89. ^ Cray 1997, pp. 69–71. ^ Cray 1997, pp. 74–76. ^ Cray 1997, pp. 79–81. ^ Cray 1997, pp. 33, 39. ^ Cray 1997, pp. 40–41. ^ Cray 1997, pp. 49–50, 61. ^ Cray 1997, p. 150. ^ Cray 1997, pp. 61–62. ^ Cray 1997, pp. 94–96. ^ Cray 1997, pp. 133. ^ Cray 1997, pp. 270–271. ^ Suits, Julia (November 1, 2011). The Extraordinary Catalog of Peculiar Inventions: The Curious World of the Demoulin Brothers and Their Fraternal Lodge Prank Machi nes - from Human Centipedes and Revolving Goats to ElectricCarpets and SmokingC. Penguin. ISBN 9781101545768. ^ "U.S. Famous Freemasons". Archived from the original on May 10, 2008. ^ "U.S. Famous Master Mason". Archived from the original on January 4, 2016. ^ Newton 2006, pp. 72–73. ^ Cray 1997, pp. 71–72. ^ Cray 1997, p. 90. ^ Cray 1997, pp. 77–78. ^ Cray 1997, pp. 92–94. ^ White 1982, pp. 44–67. ^ Sumi K. Cho, Redeeming Whiteness in the Shadow of Internment: Earl Warren, Brown, and a Theory of Racial Redemption, 40 Boston College Law Review 73 (1998). ^ Sandhya Ramadas, How Earl Warren Previewed Today's Civil Liberties Debate - And Got It Right in the End, 16 Asian Am. L.J. 73 (2009). ^ Edwin E. Ferguson, The California Alien Land Law and the Fourteenth Amendment, 35 Cal. L. Rev. 61 (1947). ^ Cray 1997, pp. 112–114. ^ White 1982, pp. 69–71. ^ Cray 1997, pp. 120–123. ^ Cray 1997, pp. 157–159. ^ G. Edward White (Autumn 1979). "The Unacknowledged Lesson: Earl Warren and the Japanese Relocation Controversy". Virginia Quarterly Review: 613–629. Retrieved May 12, 2012. ^ Cray 1997, pp. 112–114, 124–125. ^ Cray 1997, pp. 126–132. ^ Mitchell, Daniel J. B. (2006). "Earl Warren's Fight for California's Freeways: Setting a Path for the Nation". Southern California Quarterly. 88 (2): 205–238. doi:10.2307/41172311. JSTOR 41172311. ^ Mitchell 2003, pp. 205–206, 219–222. ^ Douglass, John Aubrey (2000). "Earl Warren's New Deal: Economic Transition, Postwar Planning, and Higher Education in California". Journal of Policy History. 12 (4): 473–512. doi:10.1353/jph.2000.0029. ^ Wollenberg, Charles. "Mendez v. Westminster: Race, nationality and segregation in California schools." California Historical Quarterly 53.4 (1974): 317-332. ^ Cray 1997, p. 196. ^ Schwartz 1983, p. 18. ^ Cray 1997, pp. 168–169. ^ Cray 1997, pp. 171–176. ^ Cray 1997, pp. 206–209. ^ Cray 1997, pp. 213–215. ^ Cray 1997, pp. 209–215. ^ Cray 1997, pp. 154–157. ^ Cray 1997, pp. 184–185. ^ Cray 1997, pp. 186–187. ^ Cray 1997, pp. 188–190. ^ Cray 1997, pp. 190–191. ^ Cray 1997, pp. 192–194. ^ Cray 1997, pp. 218–223. ^ Cray 1997, pp. 226–228. ^ Cray 1997, pp. 229–232. ^ Cray 1997, pp. 233–235. ^ Cray 1997, pp. 243–244. ^ Cray 1997, pp. 238–240. ^ Cray 1997, pp. 245–246. ^ Cray 1997, p. 248. ^ Cray 1997, pp. 246–249. ^ Abraham 1992, p. 255. ^ Cray 1997, pp. 250–253. ^ Cray 1997, pp. 261–262. ^ Cray 1997, pp. 289–290. ^ Belknap 2005, pp. 13–14. ^ Cray 1997, pp. 268–270. ^ White 1982, pp. 159–161. ^ Urofsky 2001, p. 157. ^ Powe 2000, pp. 499–500. ^ Cray 1997, pp. 445–446. ^ White 1981, pp. 462–463. ^ Hutchinson 1983, p. 927. ^ Urofsky, Melvin I. (1994). "Warren, Earl". Dictionary of American Biography, Supplement 9. p. 838. ^ Wrightsman, Lawrence S. (2006). The Psychology of the Supreme Court. p. 211. ^ Zotti, Priscilla Machado (2005). Injustice for All: Mapp vs. Ohio and the Fourth Amendment. p. 11. ^ Cray 1997, pp. 274–278. ^ Cray 1997, pp. 277–281. ^ Cray 1997, pp. 283–286. ^ Cray 1997, pp. 287–288. ^ Cray 1997, pp. 312–315. ^ Purdum, Todd S. (July 5, 2005). "Presidents, Picking Justices, Can Have Backfires". The New York Times. Retrieved June 15, 2015. ^ Smith, Jean Edward (2012). Eisenhower in War and Peace. Random House. p. 603N. ^ Cray 1997, pp. 336–337. ^ Cray 1997, pp. 290–291. ^ Carter, Robert L. (December 1968). "The Warren Court and Desegregation". Mich. L. Rev. 67 (2): 237–248. doi:10.2307/1287417. JSTOR 1287417. ^ Cray 1997, p. 320. ^ Cray 1997, pp. 345–348. ^ Cray 1997, pp. 320–322, 329–333. ^ Cray 1997, pp. 368–369. ^ Cray 1997, pp. 397–398. ^ Cray 1997, pp. 385–386, 403. ^ Cray 1997, pp. 444–445. ^ Cray 1997, p. 447. ^ a b c Cray 1997, pp. 530–531. ^ Cray 1997, pp. 373–375, 405, 530. ^ White 1981, pp. 469–470. ^ Cray 1997, pp. 438–440. ^ Cray 1997, pp. 490–491. ^ Cray 1997, pp. 481–483. ^ Cray 1997, pp. 485–487. ^ Cray 1997, pp. 491–492. ^ Cray 1997, pp. 502–503. ^ Cray 1997, pp. 386–387. ^ Cray 1997, pp. 387–391, 435. ^ Cray 1997, p. 498. ^ Cray 1997, pp. 447–449. ^ Cray 1997, pp. 372–376. ^ Cray 1997, pp. 466–468. ^ Cray 1997, pp. 403–406. ^ Cray 1997, pp. 456–460. ^ Kahn, Ronald; Kersch, Ken I., eds. (2006). The Supreme Court and American Political Development. p. 442. ^ Cray 1997, p. 380. ^ Cray 1997, pp. 379–381. ^ Gazell, James A. (September 1970). "One Man, One Vote: Its Long Germination". The Western Political Quarterly. 23 (3): 445–462. doi:10.1177/106591297002300301. JSTOR 446565. ^ Cray 1997, pp. 381–385. ^ Cray 1997, pp. 406–407. ^ Cray 1997, p. 433. ^ Cray 1997, pp. 432–435. ^ McKay, Robert B. (December 1968). "Reapportionment: Success Story of the Warren Court". Mich. L. Rev. 67 (2): 223–236. doi:10.2307/1287416. JSTOR 1287416. ^ Cray 1997, pp. 408–410. ^ Cray 1997, pp. 441–442. ^ Cray 1997, pp. 469–470. ^ Cray 1997, pp. 449–452. ^ Cray 1997, pp. 470–471. ^ Cray 1997, pp. 484–485. ^ Cray 1997, pp. 414–419. ^ a b Newton 2006, pp. 415–423, 431–442. ^ Cray 1997, pp. 428–431. ^ Holland, Max (November 1995). "The Key to the Warren Report". American Heritage. 46 (7): 50–59. ^ Cray 1997, p. 422. ^ Cray 1997, pp. 494–499. ^ Cray 1997, pp. 499–502. ^ Ward, Artemus (2002). "An Extraconstitutional Arrangement: Lyndon Johnson and the Fall of the Warren Court". White House Studies. 2 (2): 171–183. ^ Cray 1997, pp. 502–505. ^ Cray 1997, pp. 513–514. ^ Hutchinson 1983, p. 928n23. ^ Cray 1997, pp. 515–516. ^ Cray 1997, pp. 518–520. ^ Cray 1997, pp. 521–522. ^ "From the Archives: Earl Warren Dies at 83; Chief Justice for 16 Years". Los Angeles Times. July 10, 1974. Retrieved March 29, 2018. ^ Newton 2006, pp. 514. ^ Cray 1997, pp. 528–529. ^ Woodward & Armstrong 2005, p. 385. ^ Hutchinson 1983, p. 924. ^ Raoul Berger. "Government by Judiciary: The Transformation of the Fourteenth Amendment - Online Library of Liberty". Oll.libertyfund.org. Retrieved April 13, 2019. ^ Wasby, Stephen L. (July 1993). "Civil Rights and the Supreme Court: A Return of the Past". National Political Science Review. 4: 49–60. ^ Cray 1997, pp. 529–530. ^ E. Joshua Rosenkranz (January 15, 2001). "High Court's Misuse of the Past | Brennan Center for Justice". Brennancenter.org. Retrieved April 13, 2019. ^ Hutchinson 1983, p. 930. ^ Urofsky 2001, p. xii. ^ Powe 2000, p. 101. ^ Driver 2012, pp. 1103–1107. ^ "29-cent Warren". Smithsonian Postal Museum. Belknap, Michael (2005). The Supreme Court Under Earl Warren, 1953–1969. The University of South Carolina Press. ISBN 978-1-57003-563-0. Cray, Ed (1997). Chief Justice: A Biography of Earl Warren. ISBN 978-0-684-80852-9. Driver, Justin (2012). "The Constitutional Conservatism of the Warren Court". California Law Review. 100 (5): 1101–1167. JSTOR 23408735. Hutchinson, Dennis J. (1983). "Hail to the Chief: Earl Warren and the Supreme Court". Michigan Law Review. 81 (4): 922–983. doi:10.2307/1288417. JSTOR 1288417. Retrieved July 30, 2016. Mitchell, Daniel J. B. (2003). "Earl Warren's California Health Insurance Plan: What Might Have Been". Southern California Quarterly. 85 (2): 205–228. doi:10.2307/41172162. JSTOR 41172162. Newton, Jim (2006). Justice for All: Earl Warren and the Nation He Made. ISBN 978-1594482700. Patterson, James T. (2001). Brown v. Board of Education: A Civil Rights Milestone and Its Troubled Legacy. Oxford University Press. ISBN 978-0195156324. Powe, Lucas A. (2000). The Warren Court and American Politics. Belknap Press. ISBN 978-0674006836. Schwartz, Bernard (1983). Super Chief: Earl Warren and His Supreme Court, A Judicial Biography. New York University Press. ISBN 9780814778265. Urofsky, Melvin I. (2001). The Warren Court: Justices, Rulings, and Legacy. ABC-CLIO. ISBN 9781576071601. White, G. Edward (1981). 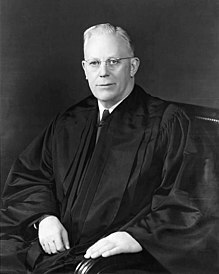 "Earl Warren as Jurist". Virginia Law Review. 67 (3): 461–551. doi:10.2307/1072897. JSTOR 1072897. White, G. Edward (1982). Earl Warren, a Public Life. Oxford University Press. ISBN 978-0-19-503121-8. Woodward, Robert; Armstrong, Scott (1979). The Brethren: Inside the Supreme Court. ISBN 978-0743274029. ISBN 978-0-380-52183-8. ISBN 978-0-671-24110-0. Horwitz, Morton J. (1999). The Warren Court and the Pursuit of Justice. Hill and Wang Critical Issues. ISBN 978-0809016259. Lewis, Anthony (1997). "Earl Warren". In Friedman, Leon; Israel, Fred L. (eds.). The Justices of the United States Supreme Court: Their Lives and Major Opinions. 4. pp. 1373–1400. ISBN 978-0791013779. Moke, Paul (2015). Earl Warren and the Struggle for Justice. Lexington Books. ISBN 978-1498520133. Rawls, James J. (1987). "The Earl Warren Oral History Project: an Appraisal". Pacific Historical Review. 56 (1): 87–97. doi:10.2307/3638827. JSTOR 3638827. Scheiber, Harry N. (2006). Earl Warren and the Warren Court: The Legacy in American and Foreign Law. Lexington Books. ISBN 978-0739116357. Schwartz, Bernard (1996). The Warren Court: A Retrospective. Oxford University Press. ISBN 978-0195104394. Schwartz, Bernard (1998). "Chief Justice Earl Warren: Super Chief in Action". Journal of Supreme Court History. 23 (1): 112–132. doi:10.1111/j.1540-5818.1998.tb00128.x. Simon, James F. (2018). Eisenhower vs. Warren: The Battle for Civil Rights and Liberties. Liveright Publishing. ISBN 9780871407665. Smemo, Kristoffer (2005). "The Little People's Century: Industrial Pluralism, Economic Development, and the Emergence of Liberal Republicanism in California, 1942-1946". Journal of American History. 101 (4): 1166–1189. doi:10.1093/jahist/jav143. Tushnet, Mark (1996). The Warren Court in Historical and Political Perspective. University of Virginia Press. ISBN 978-0813916651. Warren, Earl (1977). The Memoirs of Earl Warren. ISBN 978-0385128353. Goes only to 1954. Warren, Earl (1959). Christman, Henry M. (ed.). The Public Papers of Chief Justice Earl Warren. OCLC 184375. Speeches and decisions, 1946–1958. 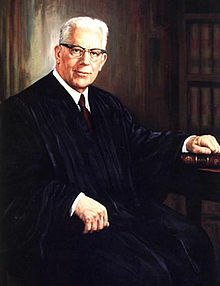 Earl Warren at the Biographical Directory of Federal Judges, a public domain publication of the Federal Judicial Center. "California 1946," (Dec 21, 1945) at the Wayback Machine (archived 2011-06-13). A speech by Earl Warren from the Commonwealth Club of California Records at the Hoover Institution Archives. "Earl Warren". Find a Grave. Retrieved September 2, 2010.